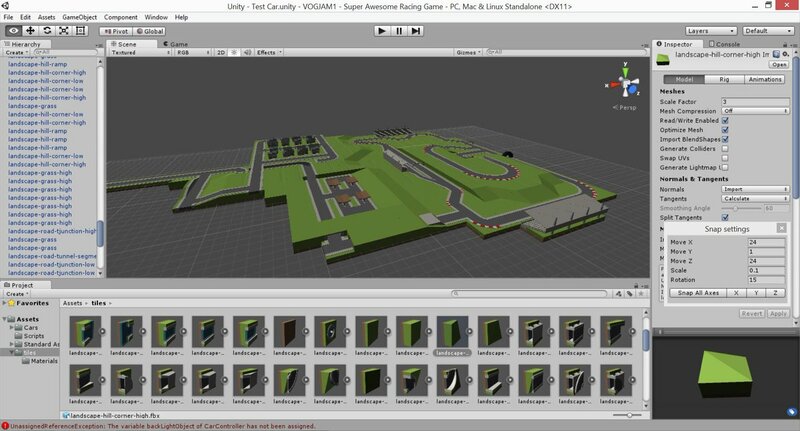 It will be a 3D racing/puzzle game where every level has something wrong or broken in it. The object is to overcome these obstacles to get to the goal line. It will be built in Unity3D. Currently, I am working on the car control and camera scripts. My goal is to have the map done by Sunday so that I can start coding the rest of the important stuff. So after scrapping two car controllers I based my new one off Randomation Games vehicle controller. It's so much better that what I was originally working with. Since I adjusted the map scale I need to modify the sidewalk height. I also plan on baking in some better lighting and adding an ocean, oh and fixing the missing colliders. Whoa, that's looking damn good for a jam game! It totally reminds me of Hard Drivin', a suitably buggy 3D car game. Nice job! This looks really good! Congratulations. This is motivating me to learn more about Unity. Sadly with only about an hour and 45 minutes until the deadline, I most likely won't be finishing on time. Good luck man!!! Remember, a late game is only late till it ships, a bad game is bad forever.